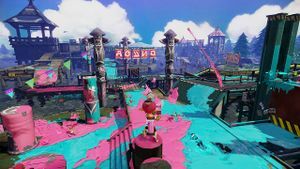 Camp Triggerfish is a multiplayer stage in Splatoon and Splatoon 2. It appears to be a wooden fort built over a lake, surrounded by a thick forest. The stage takes place on two forts, only connected on a few small paths. Gates will lower at different times in different modes, giving players easier access to the opponents' turf. They lower when a minute is left on the clock in Turf War, while they lower at the start of the match in Ranked modes. 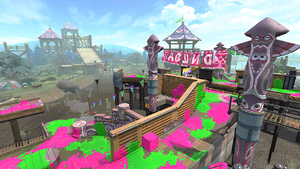 Camp Triggerfish consists of a series of bridges over water and a large area near the team's spawn, along with a shelter that can only be accessed via a grated pathway in Turf War. Both bases at Camp Triggerfish have a set of floodgates that open and close periodically. When the gates are down, it is easier for other teams to enter. Teams begin on opposite sides of the stage with bases immediately splitting into two paths. The left path leads into a large, circular area surrounded partially by a net over water. This area extends into a narrow walkway ending in high, wooden walls. The path right of each team's base leads directly into the central walkways, which are also accessible by climbing over the aforementioned walls. This path leads into an open area below a series of net catwalks, which can be used to enter the other team's base or the shelters behind their floodgates. The areas in front of the spawns are very large areas to claim turf. However, since they are very close to the areas where the enemy team can cross over to the other side, they tend to attract enemy players that manage to sneak over. Finally, these areas also lead to the backside of the walls of the center "flatboards" - areas in the middle of the map that do not have much turf to cover, nor any direct path to cross the water canal. These areas allow players to reach the top of the wall as a good perch for chargers. Many early splats will occur on the center flatboards due to the short distance between sides. On both sides, there are three sections each where grates go over the water. While only the farthest of these allow the player to cross over to the other side of the map, it should be noted that these grated areas are great spots to shoot enemies that are on the other side. However, this is a very exposed area due to the lack of solid footing. Floodgate shelters are areas on the far ends of the map that lead directly to the open area in front of spawn. While this area is a good spot to sneak over to the other side to get enemy turf and surprise splats, it is easily accessible by the other team via the floodgates that drop in the final minute of the battle. Camp Triggerfish features ambiance of chirping birds, and when players are close to the lake, rippling water as well. Upon spawning, the chirping of crickets can be briefly heard before fading. In Splatoon 2, The most notable change made is the change to the floodgates and area immediately behind them. Instead of having two floodgates, they have been replaced by a single wider gate and the area behind has been changed from a narrow corridor to an open square plaza. Two Inkrails have been added to each side of the map; one directly in front of the Spawn Point, allowing players to infiltrate the enemy side. The other is behind the wall close to the center of the map which allows a quicker path to the left side of the map. In Ranked Battles, specifications for the terrain or placement of objects are different between the modes; these changes create new paths or new objects to take cover behind. 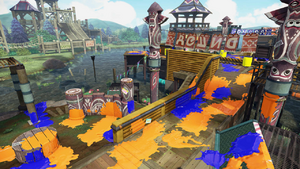 Camp Triggerfish has two Splat Zones located on opposite sides of the canal in the middle of the map. It is possible for one team to completely gain control of both Zones without setting foot into enemy territory just by shooting across the canal. The blocks on top of the Splat Zones do not count towards taking control of one. The Tower starts in the center of the two center platforms on an added platform in between. When activated, the Tower travels over the water dividing the two sides, passing by the many grated areas on either side, until it climbs up the gated section, before ending in the middle of the wide pathway in front of the spawn point. The first checkpoint is located at the turn from the central area. The second checkpoint is located underneath the netted walkway on the newly added wooden path. The Rainmaker starts on top of an added platform in the center of the map, bridging the gap between the two sides. The goals are located on opposite corners of the map, inside the floodgate shelter on the side closest to the opposing team's spawn. A stack of blocks and an inkable wall have been added to help players reach vantage points and other parts of the map quicker, as well as wooden platform added next to each of the teams' bases so they can access their side of the goal faster. Two blocks have also been added to the roped bridges to aide in attacking any player on top of the grated platform on the other side, and to provide a hiding spot for both teams. The goal is in front of the spawn point. A piece of terrain is present allowing for teams to get from their spawn point to the area that has the gate leading to the larger area. However, the Inkrail near the spawn point is still there. Camp Triggerfish underwent a series of multiple changes between its development period and release. The circular areas left of teams' bases included a much taller, independent cylinders to climb. The short stacks of boxes on the central walkways were not present. Many walls found throughout the final version are not present at all. The walkway near the round area near both teams' spawns is not present because of this. The walkways near the center were much closer to the water, lower than the area at the end of each side. The roped bridge that leads from one side to the other was not present. The grated platform closest to each teams' spawn extended farther out onto the water. The wooden bridge next to both spawns was roped, allowing players to fall through it onto solid ground below. A pre-release version of Camp Triggerfish, inked in different colors. A team of Inklings posing together in an older version of Camp Triggerfish. A shot of an older Camp Triggerfish, showing metal barrels in the sea. Camp Triggerfish was released on 24 July 2015. Adjustments to stage layout in Turf War and Splat Zones so users cannot jump directly over to the opponents' turf. Adjusted the size of the “Don’t retreat!” warning zone near team starting areas. A picture of the spawn. A team of purple Inklings on a grated panel. An Inkling with a Range Blaster shooting at the other side. A green Inkling charging into battle. An Inkling using a .52 Gal within Camp Triggerfish. A Charger user firing an explosion of ink. This picture showcasing the Inkling's clothing also shows some of the background of Camp Triggerfish. A lit torch at Camp Triggerfish. A jellyfish waving at Camp Triggerfish from Camp Jellyfish. The night sky over Camp Triggerfish during a Splatfest. Several Inklings in squid form jumping at the edge of Camp Triggerfish, with Camp Jellyfish in the background. Concept art of various objects at Camp Triggerfish. Concept art of different locations. "Playground" is an early sketch of Camp Triggerfish. A bird's-eye view of Camp Triggerfish. The return of Camp Triggerfish to Splatoon 2 was announced in the Nintendo Direct on 8 March 2018, along with Piranha Pit. It was released on 25 April 2018 at 02:00 UTC along with Version 3.0. Promo image showing Camp Jellyfish. The name of the stage is based on the real-life triggerfish. The Spanish name of this location is misspelled; its name is "Campamento Arowana" when it should be called "Campamento Arawana", since "Arowana" does not exist in that language. The Spanish and Italian versions of Splatoon were also the only editions that did not include Arowana in Arowana Mall. The Spanish version already included this fish name in this setting, while the Italian version has no setting called Arowana. Camp Jellyfish can be seen across the lake that Camp Triggerfish is built on. According to the first artbook, it takes thirty minutes to reach Camp Triggerfish from Inkopolis by express train. The totem poles are replicas of the ones that were made to honor the ancestors of the Inklings. The internal codename for this stage in the game files is "Athletic". Camp Triggerfish is the only stage in Splatoon that had a pre-release version but was not available from the start. The Squid Sisters' conversation that "Apparently they've rebuilt this place tons of times" and "Why not pick a design and THEN start building it?" are likely a reference to the long development period of Camp Triggerfish. The Squid Sisters' coversations "Ahh, a campsite! Did you bring the marshmallows? ", "No, but I brought hot dogs!" and "Let's roast marshmallows over the campfire! ", "Splat that! Team Hot Dog for LIFE!" are a reference to the third North American Splatfest, Marshmallows vs. Hot Dogs. Parachuters can sometimes be seen above Camp Triggerfish. It is unknown who or what they are, but they are probably patrons of Camp Jellyfish. Before Version 2.1.0, a glitch existed that allowed players to jump across the gap between the the two sides in the middle of the camp. Although the timing was strict, it could be achieved consistently and was therefore patched out of the game. According to an Off the Hook conversation, Pearl was the designer of Camp Triggerfish and the stage is owned by Pearl's family, stating: "Hey, did you know I designed this stage back in the day? ", "Yup. Your parents own the place, right?". It is also stated that Pearl wrote the camp song that Marie mentions in the first game. French Hippo-Camping A play on the words "hippocamp" (seahorse in French) and "camping"